in our towns history. Grafton275.org is a volunteer project through the Grafton News to help celebrate Grafton’s Birthday. This site will be a work-in-progress throughout the coming year. I’m having lots of fun learning about our towns long and interesting history. Grafton, MA is a perfect example of a quaint New England town with it’s Native American roots, and town history dating back before the American Revolution. 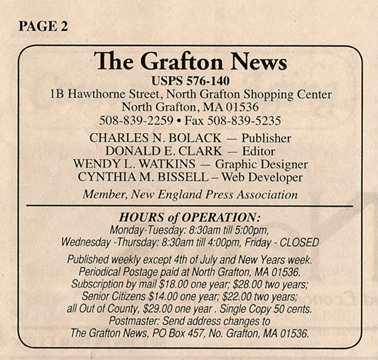 The Grafton News has been a part of the towns history for over 50 years and we have lots of historic documents and photos to share.